Make the most of your visit to Cahokia Mounds. This section provides useful information to assist you in planning before your arrival. Our volunteers will also be able to help you at the Information Desk located just inside the Main Entrance of the Interpretive Center. Stop there to get maps, ask questions or check out an audio tour. Museum admission is free, but donations are accepted and appreciated. What to Wear: Cahokia Mounds offers a World-Class Interpretive Center with museum exhibit galleries, an orientation show theater, a public programming auditorium, museum shop, a snack-food service, public restrooms, staff offices, and a courtyard for educational programs. Outdoors you’ll find self-guided tours, guided tours, trails and the 100 ft high Monks Mound, the largest earthwork in North America. There’s so much to see and do, you’ll want to stay all day! Therefore, please dress accordingly. Comfortable clothing and shoes are recommended as well as hats, sunscreen, bottled water and insect repellent. What to Bring: Visitors are welcome to bring hand-held cameras to take pictures of exhibits and site features for personal use provided that the flash is turned off while indoors. The Interpretive Center offers vending machines with snacks and cold drinks. Lunches may be brought only to the picnic grounds (located 1/2 mile West of the Interpretive Center) where picnic tables are available on a first come first serve basis. Please do not bring pets, weapons, food, beverages, gum or writing utensils inside the Interpretive Center. How to Get Here: Cahokia Mounds is accessible via numerous major routes and has a limited number of public transportation options available. Please visit the Directions and Map to your left for details. Pets: Pets are allowed on the grounds as long as they are leashed, the only pets allowed inside the building are service dogs. Cahokia Mounds State Historic Site, administered by the Illinois Historic Preservation Agency, is just eight miles from downtown St. Louis near Collinsville, Illinois, off Interstates 55-70 and 255, and Illinois 111, on Collinsville road. Entrance is free of charge, although a donation of $7 for adults, $5 for seniors, $2 for children, and $15 for families is suggested. 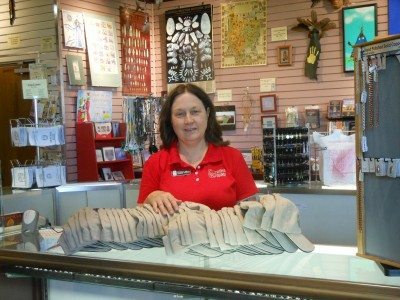 The Museum Gift Shop carries a wonderful assortment of Cahokia Mounds Souvenir items and handcrafted Native American-made items. We carry art and craft items from many of the Native American artists that participate in our Art Markets, which include pottery, jewelry, and wall hangings. There is a wide range of items varying from the Kid’s Corner to hand-made walrus-ivory sculpture from Alaskan native people. Our extensive selection of Native American jewelry is hand-picked by store manager, Linda Krieg, and represents the fine work of various Native American tribes. 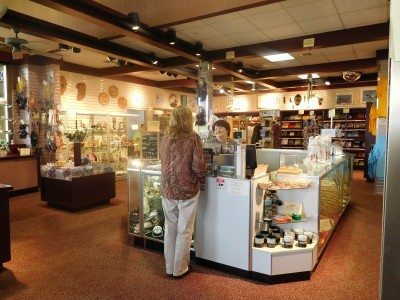 Whether you are shopping for a site souvenir, or the finest of intricate pieces of hand-crafted jewelry, there is something for everyone at the Museum Gift Shop. HOURS: 9:00 am till 4:45 pm. Take I-55/70, 64 or Highway 40 & 44 across the Poplar St. Bridge into Illinois. Follow I-55/70, not 64, to Exit 6 (Highway 111). Exit and turn right onto Highway 111 South. At stoplight make a left onto Collinsville Road. The Interpretive Center is about 1.5 miles on the right. Take I-270 East into Illinois to I-255. Take I-255 South (Memphis) to Exit 24, Collinsville Road. Exit and turn left onto Collinsville Road at the stoplight at the end of the off-ramp. The Interpretive Center is about 1.5 miles on the left. Take I-55 South or I-70 West to the I-255 exit 10, just past Collinsville. Take I-255 South (Memphis) to the next Exit (24) at Collinsville Road. Exit and turn left onto Collinsville Road at the stoplight at the end of the off-ramp. The Interpretive Center is about 1.5 miles on the left. Take I-64 East or West to I-255 North. Take I-255 North to Exit 24, Collinsville Road. Exit and turn left onto Collinsville Road at the stoplight at the end of the off-ramp. The Interpretive Center is about 1.5 miles on the left. Take I-255 across the Jefferson Barracks Bridge into Illinois. Continue on I-255 until Exit 24, Collinsville Road. Exit and turn left onto Collinsville Road at the stoplight at the end of the off-ramp. The Interpretive Center is about 1.5 miles on the left. Unfortunately, the MetroLink Bus no longer runs to Cahokia Mounds. However, there are still some public transportation options available to visitors. The Madison County Transit Bus #18 travels between downtown Collinsville and various locations in downtown St. Louis. The bus stops at the Emerson Park Metrolink train station in East St. Louis. The bus also stops at the intersection of Black Lane/Fairmont Ave. and Collinsville Road, a relatively short distance from the Interpretive Center. Adventurous visitors may get off the bus at Black Lane/Fairmont Ave. and walk approximately .76 miles West on Collinsville Road to the site. Please note it is a soft-shoulder street. See Walking Directions Here. Riverbend Transportation in Collinsville, IL will also pick up visitors from the Black Lane bus stop and bring them to the site. Please note that they have a $5 minimum on taxi service. Another option is to take the MCT Bus #18 to the Collinsville Station (located in downtown Collinsville) and take a taxi from there. The orientation show City of the Sun is shown each hour and on the half hour from 9:30 a.m. to 4:00 p.m. There is no admission fee, but a suggested donation is $7.00 for adults, $5.00 for seniors, $2.00 for students, and $15.00 for families. Please Note: Groups which are not scheduled in advance will have to wait until there is an opening to accommodate them in the Theater and Exhibit Gallery. To schedule a group visit or field trip, please contact the Great Rivers & Routes Tourism Bureau. In addition to a World-Class Interpretive Center, Cahokia Mounds offers 2,200 acres of the original site, 800 of which are accessible to the public. No trip is complete without exploring the site, climbing the 100 ft. Monks Mound and experiencing the reconstructed ancient sun calendar, Woodhenge. During June, July, and August public tours are conducted Wednesday through Saturday at 10:30 a.m. and 2:30 p.m., and Sunday at 12:30 p.m. and 2:30 p.m. The tours visit either Monks Mound or the Grand Plaza-Twin Mounds-Mound 72. The tours last approximately one hour. During April, May, September, and October public tours are conducted on Saturdays and Sundays at 2:30 p.m. No reservations are needed. Using the iPod Touch and featuring four tours: one of the Interpretive Center exhibit gallery and three of the grounds… all available in English, German and Spanish. The tours have both audio commentaries and visual components including photos, artwork, maps, and video. The outdoor tours lead the user on three different journeys through ancient history – focusing on the Grand Plaza, Monks Mound and the ancient sun calendar, Woodhenge. Tours are $3 for adults and children (pay in Gift Shop). A 5.4 mile Nature/Culture Hike booklet is available for sale in the Museum Shop. The hike goes through more remote areas of the site explaining the culture of the Mississippians, discussing where archaeology has taken place, and the use of various plants for food, medicine, dyes and fibers. 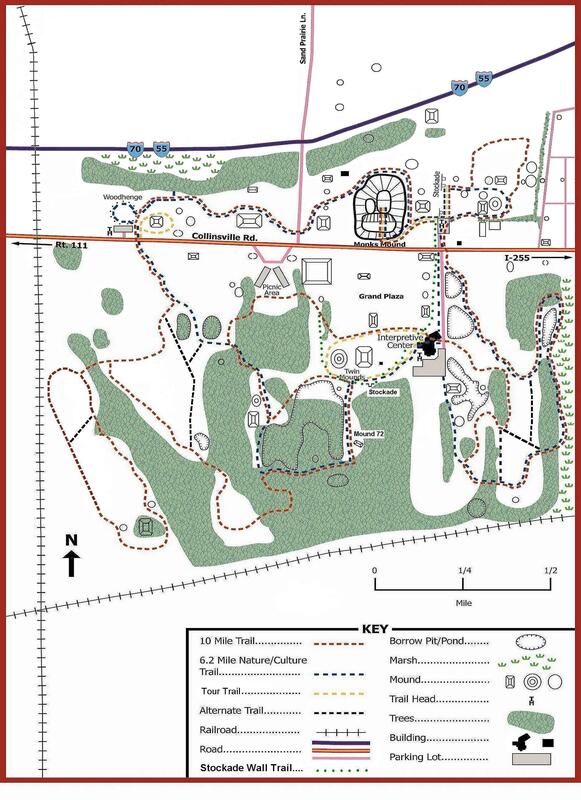 A tape cassette tour is available for free from the Information Desk; it includes three hiking trails, through the Plaza, up Monks Mound, and around Woodhenge. 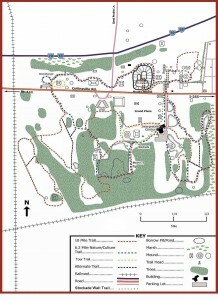 The trails take 30 – 45 minutes to walk. To check out a tape tour, a driver’s license is required for identification. Tape tours are also available in French, German, Japanese and Spanish. A 17-minute video tour of Cahokia Mounds is available for disabled visitors and may be viewed upon request. A wheelchair is also available for use in the Interpretive Center and on the Plaza tour trail, which is paved and level. For those with visual disabilities, there is a Braille guide to Monks Mound and other site features, and an Artifact Apron that can be worn through the exhibits with replica artifacts in the pockets and an accompanying tape cassette. We also have a “Museum Mural Walk” guidebook; a “Prairie Hike” guide; and Identification pamphlets for Trees, Birds, and Prairie Plants. Our Interpretation of the Cahokia site focuses on its uniqueness as an urban center, or a city. It is the largest prehistoric Indian city north of Mexico and was a religious, political, economic and cultural center. Examine the factors which qualify Cahokia as a city or urban center. Discuss the tradition known as Mississippian, of which Cahokia was a part. Explain the archaeological and anthropological research, analyses, and processes that reveal this information to us. Disseminate this information to the general public to educate and inform through our Interpretive Center exhibits, educational programs, special events, educational literature and other interpretive activities. The Interpretive Center Gallery is self-guided. Volunteers are available to answer visitor questions. There is no admission fee, but the suggested donation is $7.00 for adults, $5.00 for seniors, $2.00 for students, and $15.00 for families.